How Do I Join the SRRA? Please find attached this month’s newsletter from Hillingdon Police. Calling them meeting minutes gets a little dull. But if you want to know whats happening with Lidl Planning or a devious thief in B&M/ALDI or whether HS2 building has started, it is all below! In attendance were 52 and 14 committee members. Councillors present Eddie Lavery, Judy Kelly, Michael White, Allan Kauffman and Teji Barnes. Henry Neel of Lidl and South Ruislip SNT Sgt James Wright. Apologies were received for Mrs Val Blacker and SRRA committee member Geoff Taylor. 1.0 Opening Remarks & Welcome & Matters Arising from the Minutes & Signed Minutes. The meeting was joined by South Ruislip SNT Sgt James Wright. Discussed recent crime figures with concern over burglary and car crime. Assaults put down to police recording of even playground scraps where informed. Burglary the police feel there are two teams operating on the area, one has been disbanded with arrests made and they are working on the second. They are working in Thames Valley and the Met mixing this up with vehicle crime. Theft of personal property also high due to retail parks. Police disappointed B&M and ALDI are not paying for security. Local police targeting a prolific female thief in B&M/ALDA, with thefts “almost daily”. Sgt Wright suggested not taking whole bag there only credit cards which can be replaced with little loss. They are working on the robbery in Victoria Road. The perpetrators left behind vehicle forensics and items dropped which have created a number of leads for the police but they are waiting on those forensics results. Have planning consent at committee on the 11th January. They are discharging planning conditions, agreeing S106 and 278 highway works. The next stage for confirmation of the build is from the Mayors office/ GLA an then Hillingdon will give Lidl formal confirmation. Approval is expected and they look to start on site April and open by Christmas. Question regarding S106 spend. Henry Neel suggested looking online for full report on planning website. But the exact details of the planned costs are still being agreed with London Borough of Hillingdon officers. Plans for the site can be found here. As at 30th December 2016 current account £247.24 Reserve account £13,365.46. Full accounts at the AGM but we made a small surplus. Thank you to Lynne Kauffman for organising with distribution of this month’s newsletter with various members of the committee and to the Road Stewards for their delivery. Handed over with fit out expected by May. Small delay caused by a power cut. Developers hope to host an open evening event, which we will make open to SRRA meeting attendees, if we can. Sid keen to look at the cinema as it built so following that closely. Citygrove has purchased a sculpture which they will unveil. Bellway housing opening on a different timescale. The walkway to open linking to Station Approach as the commercial site opens. Looks like it will go ahead. Work to start at the end of the year. HS2 forced to reveal data on housing purchase and compensation deals to make a more level playing field for people. Tunnel from old oak common. Need to dig up for sewers on Long Drive/Station Approach/Bridgewater Road/West End Road. Concern the work will take a couple of years rather than just months. The impact will be massive as Allan pointed out to parliament at HS2 hearing. 22nd July is the date for the family day only a little flying. Circa 8000 tickets, meant to be a local event. £5 adults £3 children. Update from Allan and Lynne Kauffman. Now organised by Dettie Quirke (who is running youth centres across the borough) who is actively seeking to regenerate activity for local children and aim to get the children back in with a series of targeted activities. Open evening there tonight. Youth workers will be full time over summer holiday. On a day to day basis four youth workers at the moment. Lynne Kaufman confident in roving care taker, Bill who looks to take pride in the centre. Seeking Youth volunteers. Dettie Quirke will come and talk to us at a future date. After hearing a rumour from Sainsburys staff at SR that the store might close, Sid rang the David Mills Property Manager who said that it was a good store, trading well and not closing. Sid asked him about improving the store, and offered some suggestions and he will hopefully come back to us. From Cllr Allan Kauffman. Looked with officers at the parade as the area looks poor compared to the modern Dairy Development. The trees to be pollarded or replaced and new pavements with more trees and seating. Lots of planters by the railings and modular flower display – possibly paid for my SRRA. Price set to be around £200,000. Paid on S106 and TFL funds. Should happen in this year. Concern expressed that once work done it will be dug up again and ruined by work such as HS2 and ARLA in the area. Sid said that contractors would be obliged to return the site to the same condition. Good Christmas lights next year. Asked for green, white and red rather than colder blue and white ones. Bridge works. Plans drawn up to clad the brickwork, with a higher walkway and better lighting. Taken up with TFL. Cost is circa £350,000. Allan to continue to work on this. Positive response to road changes at the junction of Long Drive and Victoria Road but request for better signage and consideration for speeding the southerly route onto West End Road from Station Approach. Discussed difficulty in doing that and the knock on effect of heavy traffic and poor road layout at the Target roundabout. Cars on Victoria Road, concern with parking both sides of the road. Looking at changes to either one side of the road or both. Likely to lose trees but will replant. 13.0 Great Central House, Great Central Avenue Opposite Station. Aware of planning and councillors aware but it is not on planning schedule as yet. Concern re overcrowding in the area. Ex-Fireman expressed concern about buggies etc left in the stairway as it is a means of escape route and should be clear at all times. Councils responsibility under the regulatory reform order. It’s a protected route. Allan said he would follow this up with enforcement officers. Buying flowers in the parade on Long Drive, Sid asked in the Florist about the chamber of commerce and said that the response was so enthusiastic he was greatly encouraged. Next meeting of the Chamber in Feb. Plenty of space for meetings without over reliance on the Ramada. We support and Sid will attend a future meeting. Sanjay chair been trading for 30 years in car repair and we know he is very keen on the area. Nursery expanding into adjacent buildings with positive trading. Historically disruptive to neighbours. Not so bad last year. Revitalise efforts and awareness amongst police and Hillingdon council officers when close to festival season. Corsa being sold from the area. Illegally running a business. Plan to block the area with no parking between 10am and 12am to stop vehicles being left there, such as the van advertising the hand car wash which does not seem to have moved in 5 years. It is also bad for the nursing home at Brackenbridge House. Parking changes have gone to consultation. Road resurfaced, part of this is due to work by David Seaman campaigning. Needs bollard placing to stop cars cutting through in a somewhat dangerous fashion. This element to be done at residents cost by a resident builder. Resurface work paid for by the Chrysalis fund. Keen to stay with rest of Ruislip rather than split off with Ealing wards and Hillingdon area. Lady wrote asking what is happening. We await the Boundary Commission’s recommendations in due course but it will take a while as due to affect 2020 elections. 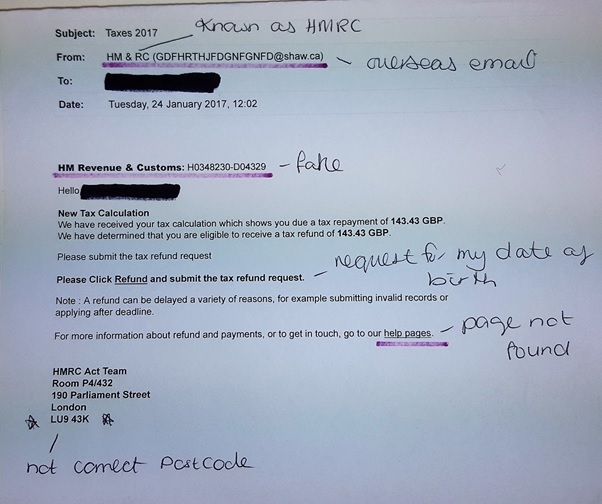 From Cllr Teji Barnes – Watch out for scam emails which contain promises of tax refunds. Such as this one. Allan Kauffman – Bought by a worship group in 2013. They put in a change of use to change to worship use and a retail use below. A tiler currently works below. This was refused for numerous reasons, mainly as an industrial area not for worship. If they got planning permission it would add traffic and block the road. [Secretary : It sounded like the application was not formally refused for change of use.] They’ve also set up marques and events (non-permanent) which we would expect them to hold license for to operate. Sid wanted to know what they could put in a petition against Lidl who is trying to act correctly legally and they stopped planning (albeit temporarily). Can’t the council refuse the petition because it comes from a body operating illegally? Why are planning enforcement officers not following this up on it? Cllr Lavery spoke (as a councillor who chaired the planing committee meetings). 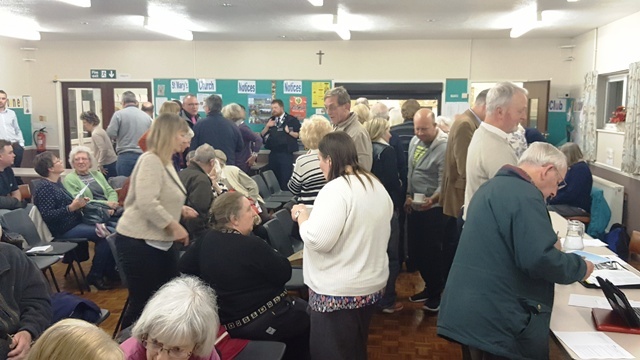 They were presented with a valid petition (which just needs 20 Hillingdon residents signatures to be valid regardless of anything else) at the meeting but it was never considered or explored as Lidl agreed to make changes to the plan to move things around. However the committee can only rule on the proposition that is presented not one changed. Thus the planning decision was deferred. The meeting did not get further to consider the decision. Lidl came back with a revised scheme. Thank you for the tea and coffee and the all the help getting the newsletters out. Minutes signed off. Item 3. Pedestrian access. Walkway to be open when the commercial site is opened for access from Long Drive. Update from Ward Sgt James Burgess. Many moves in the Safer Neighbourhood Team (SNT) for South Ruislip. Insp Rob Bryan has been promoted to Chief Inspector in charge of SNT’s. Sgt Burgess has three constables, new and all keen and adept. Sgt Burgess has been in the police for thirteen years. Mostly in neighbourhoods. Ward Sgt for 8 weeks. Complaints about Field End Rd, Paddock Road, drug use. 3 drugs arrests including 70 wraps of heroin. Also cannabis. Also complaints in The Fairway. Vehicle and knife seized. Sgt Burgess said that they were successes as a result of information from residents, so please inform the police. They want more information. Personally to the SNT, by dialling 101, twitter and email. Don’t mind the route, just get them the information about local criminal activity. Burglary figures. In May, 11 down to 2 in June. In a recent case a burglary was started, the alarm went off and the burglar was scared away by alarm. First break in for a while. The message from the police is take sensible precautions and reduce your risk. One gentleman asked about cycling on pavements which Sgt Burgess explained was an issue he was hot on. Discussed children riding on bikes recklessly in Queens Walk and Mount Pleasant. Cllr Kauffman mentioned Kings College as a good diversion for attention and hinted at plans for South Ruislip for BMX course/skateboarding and things of that ilk. “Watch this space”. No plans to reopen the satellite police station on The Runway in South Ruislip. But plans locally to improve visibility of police by walking in the ward. Aim to be on the ward for shifts including on late shifts up to midnight. Brackenbridge. Issues with kids on motorbikes. The police have seen this as well whilst walking in parks near West End Road and Bridgewater Road in the field. Comments that they were gathering in White Butts. Complaint about a noisy motorbike in the area. Details taken by the police. Hannah OC Operations and Squadron Leader James Tenniswood, Media and communications officer. Round up of recent occurrences. There are two thousand people on the unit. The looked after the spare for Marine One which was brought in by C17. They have been involved with Exercise Griffon Strike in Cornwall, taking senior MOD and ministers there via helicopter to watch the drill. Keeping them most busy – flights for Senior Ministers and Royal Family. Parliament in recess so a little quieter. But there have been a lot of short notice flights recently. Also they site the two helicopters for London Air Ambulance. Their flying times are limited by sunlight. Flight safety. Concern about local drones activity. Need users to stick to the CAA regulations. Lasers. Being shone on planes are a risk to the sight of pilots. There are hotspots for lasers use in Field End Road and Long Drive. Wingfield Way. Hedges cant be cut at the moment due to nesting season. Not cut April to July. Can do it in August and they will do. The station was awarded Station of the Year by RAF Benevolent fund, for raising funds, £53,000 for this charity and raised £230,000 in a year for all the charities. Questions about a quirky and noisy plane which was identified as a Piago airplane. Belongs to Italian air staff. Comments that there are a lot of helicopter movements at the moment. The RAF representatives said they felt the number of movements for them was low, but there the base has a helicopter lane route over RAF Northolt. Apart from exercises not many there really. Just fly over head. Maintenance on runway to take place in the next two years. But waiting and don’t know when. It will close for 6-9 months for fixed wing aircraft. Comment from the floor about Project ARC meaning RAF Northolt could take up to 50,000 movements at year. 12,000 cap per year is the remit subject to ministerial approval. Operational tempo meant that the RAF Northolt open day is a staff only event. However in 2017 the idea is a community open day so there will be a focus on local people getting tickets rather than plane/RAF buffs. They will advise more at the next RAF/community meeting. Current account £329.24 and deposit account £13,362.89 in reserve at 25th July 2016. Outstanding £140 for a newsletter and ID tags £15. Thanked the Road Stewards. Vacancies for Exmouth Road (40) Queens Walk (22) West End Road (12). Discussed Lanyard’s. The lanyard was the expensive part of the fit out. Mahlon Avenue & Hardy Avenue did not receive a newsletter from Kate. Discussed the routine of the newsletters going out. Geoff reiterated the need for up to date list of houses and the roads. Rubbish Bins. Spate of domestic waste in waste bins. Roads to resurfaced Brackenbridge Road, Abbots close, Down Barnes, White Butts and Stafford Road. Next challenge is the pavements. First is Long Drive. Green Flags – most awards in Hillingdon in the country. Awarded to parks for amenity and trees. Very proud of Hillingdon’s Green spaces and this award. Bridge at South Ruislip Station Approach: Looking for a proposal from officers to improve the immediate area of the bridge, passed to TFL for £350,000. Ruislip Manor work cost £11 Million. Complaints about weeds on Rydal Way. Sent photos to Cllr Judy Kelly. Comment on weed sprayer on a quad bike, being done at speed so possibly ineffective. Complaint about bridge and pigeons at Ruislip Gardens. Cited to open one week before Easter. Shopkeepers in The Fairway complained about spaces being taken up being used for spoil. Parking spaces to be returned for customer use from Allan. Have started the road widening. Action Alliance against HS2. Cost currently £55 Billion. Spent £1 and a quarter billion with nothing to show for it. We believe part of Europe wide high speed rail link, but this idea is broken in London anyway. Expected downturn in the economy and so anti groups are hoping HS2 might be a casualty. 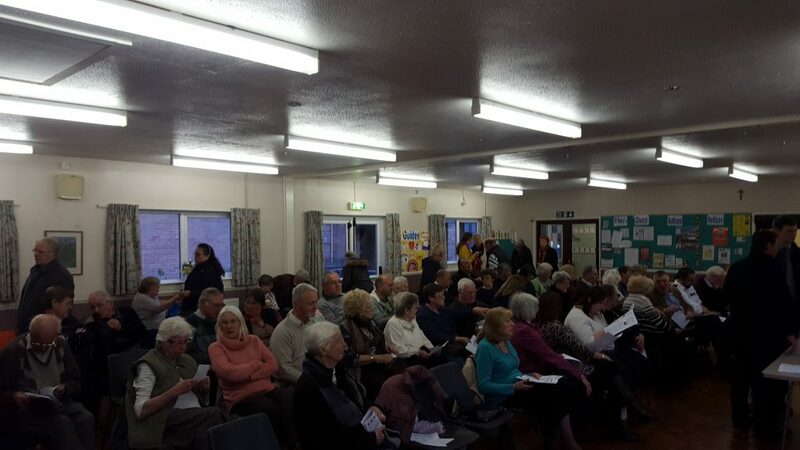 In attendance were 65 residents and 11 committee members. Councillors present Judy Kelly and Eddie Lavery. Apologies were received from: Jenny Hunt and Cllr Kaufmann, PC Jack Duerden. 1.0 Minutes signed off and Vice Chair Sid Jackson opened the meeting. Acting Sergeant Tristan Brown has recently taken on this role. His dedicated ward officers are Sarah Fordham (Manor) and Ajay Shah (Cavendish). Skeletal remains were found. The police believe they have identified the person. The person had been missing since last year. The polices working hypothesis is that the person, sadly, died sleeping rough. Bellway Homes are the construction company building the residential homes at the ARLA site. Construction will be fully complete in two years time. Sales of the first phase opened at the weekend. They are sold out on the first release. They are working on the site with other construction companies Simmons and Stace, who deal with the commercial side of the development. Site access for pedestrians. Bellway are creating a pedestrian walkway through from Station Approach which will be at the side of the Middlesex Arms. Traffic will be separate from the shopping side of the development giving residents their own access to the site. Drawing showed trees on the plans, but these have all been removed. Established trees removed in the construction phase but other trees and landscaping will be planted at the perimeter. This will be completed towards the end of the development. Question about affordable / housing association properties and quantity and proportion of these. 163 plots in total and there are 18 shared ownership homes which will be affordable and 18 rented units to let via a housing association. No HA yet appointed to manage these. What of car parking at the site? Parking is one space for one flat/property. Generally thought to be low, but meets regulations etc. Are these properties all sold to overseas buyers? Not really, many local buyers, property advertised locally and many sold to local people. Sid visited the ARLA site. Impressive. On target for completion by end of year. Likely to be open around Easter next year. The Focus site entrance opposite West Mead (now Aldi / B&M) will close and entrance will be part of the overall scheme. First phase plans approved for the development at Victoria Road, but the larger development is still waiting points to be cleared and planning application then will go to planning committee meeting. Seeing movement in MP’s positions from opposition to mitigate the disruption that construction will cause. See this as a sign that work will go ahead. Current account balance £1,229.88. Reserve £12,361.33. Hunting for Road Stewards for The Fairway, Diamond Road, Royal Crescent. Wingfield Way. Simple task to visit the houses and deliver. Collecting the money is also simple, can be completed in a way that suits you. The following officers were returned as standing for the following year. Cllr Judy Kelly petition raised from local residents on Harvey Road re the disruptive behaviour from the site. SKLP were better neighbours in 2014, but were more disruptive later last year with a poorer response from council officers and the police to the issues raised by residents. Keen to improve the situation again for residents. Conversations with councillors have been ongoing. Set up meetings about way forward. Report update when know more. Much work especially by Cllr Kauffman. Flats will house people in need of temporary housing. They can house up to four people. Owned by Hillingdon but leased to a housing association. An open day is being arranged by the provider to view the flats for local residents. Date tba. Cat and mouse with council officers. Now not advertised. Looking at parking meters. Looking to improve Station Approach. Written to mayor, designers worked site. Bridge is very dark. When it floods can’t get through. Walls seep moisture. Perhaps put cladding on, raise pavement by two foot and raise light levels. Circa £353k cost to improve. Station Commander here next meeting. The runway is going to be resurfaced next year. New base to the tarmac needed, very invasive work. Therefore the runway is going to close next year for around 9 months. Display. Question from floor about whether flying displays will be affected following crash at Shoreham. Sid felt not as displays not aerobatic. Flybe. Wrote wanting to fly from Northolt. Sid said feeling was it won’t happen. Can’t operate scheduled flights as military has priority. Once start to have a schedule the military would lose control. There are also restrictions on aircraft passenger numbers due to ambulance cover, fire covers etc. Not in foreseeable future. Secretary Jeremy left, and Lynne Kauffman kindly completed the minutes for the evening. 11 VC Jackson carried out a vote to verify the proposed and seconded officers of the executive. There was an overwhelming positive vote for all all committee members carried forward. Open invitation to any member who wishes to attend the executive meetings 9thJune, 14July. 12 Update requested on the ground between the library and the youth centre on Victoria Road. Cllr Lavery stated that it was council owned land. Cllr Kelly reported on the site history for the development of the site. Cllr Kauffman and Cllr Kelly to investigate. Members question Question on the fly tipping opposite the dentists on Northolt Avenue. To be resolved through an Members Enquiry. Members question Use and development of the site on Station approach that was previously a nursery. Cllr Kelly though it was to be used for a day centre. Lunch club was mentioned but there is already a lunch club held at St Mary’s church hall 3 x per week run by Good Neighbours the club includes transport and outings. Publicise the lunch club in the newsletter to attract new members. GT(Chief Road Steward) raised the issue of identification for road stewards- use of photographs was suggested by a member. GT requested support still required for deliveries. LC community report – Jim O’Neill walk almost impassable because of lack of drainage- suggested use of the Chrysalis fund to improve drainage. CH no points to raise. Non committee member(editor of newsletter) LK promoted the open meeting on EU for all South Ruislip residents 29th April 7:30 at the Ramada Hotel. Question raised ‘Are we likely to see more of Boris once the election is over. VC to invite Boris Johnson to a meeting. Cllrs mentioned BJ’s surgery on Friday evening. VC thanked members for attending meeting closed at 9:28pm. Date of the next meeting 27th July. From Tristan Brown of the Met…. Welcome to your weekly update. Within these updates I will focus on local crime and the issues effecting you and the local community. My last crime update has been very well received with some excellent feedback. If you feel you have prevented a crime, seen some suspicious activity, and you believe other readers would benefit from knowing, please reply and it will considered for entry in to the next crime update. I aim to send these updates on the Monday of the following week. However, this will be dependant on shift patterns and availability of data. 07-04-16 to 08-04-16 – Overnight – Warren Drive, Ruislip – Motorcycle stolen from front garden of property. Registration FX51ONG. Ref 0906894/16. If you were a witness to any of the above crimes or have any information, please call 101 or make contact by either of the means below. Over the last couple of weeks we have been receiving reports of suspicious activity possibly concerning drug use/supply. Please report any incidents of this nature to us. This information is crucial if we are to build a picture of what is happening and where. We collate this information, look at trends and work to identify and arrest offenders. Burglary and its prevention and detection will remain our priority. There are some simple steps residents can take to safeguard themselves. These include the fitting of an alarm or dummy alarm box. Ensuring all windows and doors are locked. UPVC doors need to be locked with the key as well as lifting the door handle. Use a timer to illuminate a lamp at dusk. The list goes on and there are further suggestions in the leaflets below. Don’t be a victim of burglary. Follow this advice. Have you been a witness to any suspicious behaviour that may be of interest to your local Police officers? Please let us know. All information is gratefully received. Last week a North Hillingdon elderly resident was contacted by someone pretending to be from the Surrey Police. These fraudsters can seem very believable and unfortunately they were able to con the resident into withdrawing money and handing it over to a courier believing it was being taken to the police. Police, banks or other agencies or companies will not ring up and ask you to withdraw money ever. Do not withdraw money and hand it over to a courier because someone claiming to be in authority has told you to. Don’t ring any numbers given to you by the fraudsters and if they tell you to hang up and ring 101 to check, don’t as this is also a scam – they leave the line open and simply pretend to be the police. Hang up and ring someone you know first so you know they are off the line. Then ring 101 and report to us immediately. Our neighbouring police forces are seeing an increase in theft of tools from Ford Transit vans. The vans are being opened with devises that apparently over-ride the locking mechanism – no key needed and they don’t have to force entry. Sadly, in this day and age of modern technology, it seems there is always a devise available to bypass keyless entry. Our advice is to empty your van over night. Whilst this is not always practicable, a solid lock across all doors is also recommended. Whilst many van owners put them on the back doors, the other entry points are often overlooked. As keyless entry becomes more widespread, our advice for all vehicle owners is to consider using a good old fashioned steering wheel lock. Shop owners – please be aware that a number of fake £50 notes are doing the rounds. Please be very cautious of anyone trying to break a large note or asking for change from it. Those trying to offload these notes often target small businesses with single members of staff. Please ask your employees to be vigilant and if they are concerned, call police straight away. From Wednesday the 6th of April, it is now law that all dogs must be registered and micro chipped by the time they are eight weeks old. This falls under the Animal Welfare Act 2006. Dog owners are also required to keep their contact details up to date. If local authorities discover a dog without a microchip, owners will have 21 days in which to have one fitted or face a fine of up to £500. Have you received an email from an unknown source requesting payment for an outstanding invoice? Does the sender know your address? You are likely to have received the latest scam email. Regarding the amount due 1635.14 GBP, we act on behalf of Particle Technology Ltd in order to collect the outstanding account value of your debt. People are falling victim to this scam. Don’t be fooled by the fact your name and address are known. Clicking on the link (which I have disabled in the above message) will install a virus on to your computer. This virus then encrypts victims’ files and demands a ransom be paid before they can be unlocked. Are you interested in setting up a neighbourhood watch scheme for your road? Get in touch and we will be pleased to help you. 17-03-2016 to 20-03-2016 – Field End Road, Ruislip – Suspects have kicked the rear door off the hinges and entered the property. No items stolen. Ref 0905611/16. 21-03-2016 – PM – Bideford Road, Ruislip – Suspects have entered property via a rear door. Jewellery and cash stolen. Ref 0905739/16. 21-03-2016 – PM – Oak Grove, Ruislip – Suspects have forced entry via a rear door. No items stolen. Ref 0905740/16. 21-03-2016 – PM – Seaton Gardens, Ruislip – Suspects have gained entry by smashing a rear patio door and forcing a kitchen window. Witness has seen four IC1 males leave the venue and drive away in a black saloon vehicle. 22-03-2016 – Overnight – Ashburton Road, Ruislip – Suspects have entered vehicle by an unknown method and damaged ignition barrel. (See crime prevention below) Vehicle not stolen. Ref 0905818/16. 24-03-2016 – Overnight – Windmill Way, Ruislip – Suspects have stolen a Silver Honda CBF-4 motorcycle with registration FX05YXN. Ref 0905995/16. 25-03-2016 – PM – Denbigh Close, Ruislip – Number plates stolen from vehicle. Ref 0906058/16. There are currently two main locking systems for vehicles. These are key fob and keyless entry. Both can leave your vehicle vulnerable to crime if certain precautions are not taken. The system works by sending random combinations of code to the vehicle each time the fob is pressed. Therefore, thieves copying the code is useless so they have come up with another way to prevent you from locking your vehicle. Thieves are overcoming this by jamming the signal from your key fob to your vehicle by using a number of different devices. These devices can be purchased from as little as £2 from the internet and come in many forms such as garage door openers and house light controllers/dimmers. Many of these devices act to block your key fobs when you attempt to lock your vehicle. Thieves are able to block signals in whole areas such as car parks or streets by hiding these devices in bushes with a clothes peg activating the device for long periods of time and without the need for them to be in the vicinity. There is a solution. Once you have activated your key fob, YOU MUST ensure the lights have flashed indicating the car has received the signal, and then check the vehicle is locked by lifting a door handle. The signal for a vehicle with keyless entry cannot be jammed so thieves will simply smash a window to steal your property. The signal used for vehicles with this form of security system is unchanging and broadcasts continuously between the fob and the vehicle. IT CAN BE COPIED. Fobs made by different manufacturers use different ranges and the signal can vary in terms of strength and useable distance. This is the distance between the vehicle and the range in which the vehicle will be unlocked. This can be up to 30 feet from the vehicle. For many people this could be less than the distance between your vehicle and where you leave your keys once inside your home. YOUR VEHICLE MIGHT NOT BE LOCKED. Alternatively, if your fob is transmitting continuously, the distance between where the device is in your home and the pavement, driveway etc. may be sufficient for a potential thief to copy the signal. Once copied the thief can not only enter your car but also steal it or any property within it. If you have a vehicle with a keyless entry system, keep the key in a ‘Faraday Cage’ where the signal cannot escape. This is the same advice as given to us in relation to tap credit and debit cards. You can now purchase small metal credit card cases at an affordable price. You can then remove the plastic card holders and keep your key fob in there. Search for RFID blocking case/wallet. DO NOT leave anything on display that a thief may find attractive. This includes any electronic/valuable items such as phones and sat navs, but also be aware of other items such as bags, child seats and clothing. http://www.actionfraud.police.uk/ The UK’s national fraud and cyber crime reporting centre. I have been made aware that an elderly neighbour, who lives alone, received an unsolicited telephone call from a lady purporting to be from a well know local estate agent in Ruislip Manor. The caller tried to suggest that it was in my elderly neighbours best interests to sell her house. My neighbour stated that she had no intention of selling her house and the caller apparently did not take no for an answer and said that she would call back in a month and pop around to have a cup of tea and discuss the matter further. My neighbour was understandably upset by this episode and I have asked her to call 999 should the lady caller turn up at her home. I have reassured my neighbour that she did the right thing by refusing to be drawn into this situation. I have informed the estate agent that it appears that someone has used their name and have made the Police Safer neighbourhood team aware of this incident. Perhaps members of SRRA could make their neighbours aware of this please, just in case this is not a one off incident. This month I would return to my most popular topic – good work by your local police. A detective in the making: Last month PC Stawiecki identified a pattern of shoplifting offences and established they were being committed by the same pair of thieves. He gathered all the necessary evidence from a number of stores then arranged an early morning visit for the pair. His excellent evidence meant both put their hands up and were charged with 11 offences. Calling 999 unnecessarily affects our ability to deal with proper incidents: PC Foley and PC Moore dealt with a local resident who was calling police on a daily basis making a variety of accusations including that his neighbour had a gun. The officers identified that the person was in need of medical care and were successful in getting him to hospital for a mental health assessment. Since then the bogus calls have stopped, giving us more time to respond to real emergencies. Villains – we know what you look like: Having local bobbies means the faces of criminals are well known. After parking meters in Eastcote were targeted by thieves, PC Brown trawled through CCTV footage and identified the main offenders. PC Brown set about locating the offenders and caught them in the act of counting the money they had just stolen from another parking meter! As a result of her hard work and perseverance PC Brown secured 6 charges of theft against these offenders. Villains – we know what you look like part 2: Police received a call to a woman heard screaming in a local address. PC Foley recognised the address and realised it was likely to be a person subject to a non-molestation order returning to the address. He informed his colleagues of who he thought it was. PC Hamilton and PCSO Parihar were in the area and spotted that person going past them in the other direction on a bus. Their eagles eyes meant they were able to stop the bus and arrest the person for breaching the order. Villains – we know what you look like part 3: I think you get the point – local officers with local knowledge mean local crooks are often captured. PC Foley again, this time investigating a theft of a wallet from a local store. PC Foley was able to identify the suspect on the CCTV and make an early arrest. The strength of evident against this person meant he fully admitted the offence when interviewed. A police uniform can work magic: Whilst on patrol PC Christmas was approached by a man who said he had left his wallet in a local pub the night before. When he realised his loss he contacted the pub but they told him they didn’t have it. He was convinced that he had left it there. PC Christmas attended the pub and was insistent that they tried a bit harder to find this wallet. His persistence paid off, the wallet was found and returned to the owner with everything still inside it. The owner was really happy that police had managed to help him out where he felt that he was not able to do anything further himself. Traffic signs apply to everyone: Sgt Fanton and her team have carried out a number of traffic operations in Northgate where there is a no right turn sign from Ducks Hill Road. This was in response to complaints from residents in Northgate that the route was used as a cut through and the restrictions flouted by drivers all the time. Approximately 40 cars were stopped and warned about their actions. Other offences were also identified and resulted in several cars being seized and drivers being reported. Youth disorder: In recent weeks Ruislip High Street and the fast food outlets there have seen a rise in youth disorder. A range of tactics have been used to try and get this under control. At one end of the scale PC Murphy and PC Brown arrested two youths for public order offences – those kids are now subject to the judicial system because of their behaviour and because they were also found in possession of drugs. Sgt Charlston and I have also met with local fast food restaurant managers, agreeing on a number of tactics to make their restaurants less of a haven for bad behaviour – yes, that includes officers sitting in the restaurants drinking coffee. We are reclaiming the space, not putting our feet up! The names of those we deal with (the majority of whom are very local) are being shared with the local secondary schools who will also be educating these young people. This work is still ongoing. Bad days have long lasting consequences: PC Groome investigated an incident where a man purposefully dragged his key down the side of a car parked at a local gym. There was no reason for him to do this and no previous relationship with the owner of the car. He seemingly was having a bad day and decided to take in out on an innocent person’s car. PC Groome arrested him and he has been charged and will be attending court. Don’t be a bad neighbour: PC Low secured a 10-year Criminal Behaviour Order against Celia Tan at her sentencing hearing at Harrow Crown Court this month. Celia Tan had subjected her neighbours to a campaign of malicious and escalating harassment which included her driving at the neighbour’s children. She was also given a 2-year suspended sentence in addition to the 5-months she spent on remand prior to the trial. There is no doubt this woman made her neighbour’s life a misery and PC Low’s excellent work has finally brought her to book. Acting on information received: PC Christopher acted on intelligence received from local residents and execute a search warrant at an address in Eastcote. He arrested one person for drug offences and a police style acrylic baton was also recovered from the address. Ring 101 or Crimestoppers if you know of wrongdoing, or speak to your local officer. Partnership working: Sgt Kerr and his team carried out another joint operation with Immigration Services targeting illegal workers and anti-social behaviour in Bradfield Road as a result of complaints by local residents. A police dispersal order was put in place whereby 17 persons were issued notices and 7 were arrested for immigration offences. Disgusting: A family was being harassed over a period of time culminating in dog faeces being smeared over their front door and car. PC Moore worked hard to link the suspect to the crime, eventually getting sufficient evidence to secure a charge of criminal damage. The victim and his family were very grateful for PC Moore’s efforts in finally dealing with an individual who was affecting their lives. Remember, this is a snapshot only of what your local officers are up to. They do so much more on top. Royal Mail Customs Scam: Don’t Open Attachments you don’t trust! Please accept our apologies for any inconvenience this may have caused.To help the spread of the virus, the email also says: “you will need to have access to a computer to download and open the Zip file”. If you receive one of these emails, do not click on any links or download any attachments and report it to Action Fraud. · Royal Mail will never send an email asking for credit card numbers or other personal or confidential information. · Royal Mail will never ask customers to enter information on a page that isn’t part of the Royal Mail website. · Royal Mail will never include attachments unless the email was solicited by a customer e.g. customer has contacted Royal Mail with an enquiry or has signed up for updates from Royal Mail. · Royal Mail have also stressed that they do not receive a person’s email address as part of any home shopping experience. Total Policing is the Met’s commitment to be on the streets and in your communities to catch offenders, prevent crime and support victims. We are here for London, working with you to make our capital safer. NOTICE – This email and any attachments may be confidential, subject to copyright and/or legal privilege and are intended solely for the use of the intended recipient. If you have received this email in error, please notify the sender and delete it from your system. To avoid incurring legal liabilities, you must not distribute or copy the information in this email without the permission of the sender. MPS communication systems are monitored to the extent permitted by law. Consequently, any email and/or attachments may be read by monitoring staff. Only specified personnel are authorised to conclude any binding agreement on behalf of the MPS by email. The MPS accepts no responsibility for unauthorised agreements reached with other employees or agents. The security of this email and any attachments cannot be guaranteed. Email messages are routinely scanned but malicious software infection and corruption of content can still occur during transmission over the Internet. Any views or opinions expressed in this communication are solely those of the author and do not necessarily represent those of the Metropolitan Police Service (MPS). Don’t panic! It is not a major upheaval, just some changes to supervision ratios. In April, we will be changing from 4 clusters to 3. Right now, I cover the 9 wards north of the A40 and under the changes this remains unchanged. The changes occur elsewhere. South cluster, which currently has 4 wards is being split and 2 wards each are being added to East and West clusters. At local level, this means no visible changes as those team will continue to work out of polar Park. The immediate change is obviously 1 less inspector. In this case, Insp George will move from the deleted South cluster and take on the West cluster which is currently covered by an acting inspector. In simple terms for us up north, no change. I do however have two sergeants who are moving on to tell you about. Sgt Jonno Shard (Manor and Cavendish wards) is being promoted on 7 March and moving to Hounslow. I have a new PC moving to his team called Tristan Brown. He has passed his sergeants exams and in the short term he will cover that post. My May, I hope to have a substantive sergeant filling that post again. Also, Sgt Chris Kerr (South Ruislip) is transferring to the Borough Tasking Unit on 4 April. The good news is that he will be replaced by Sgt Karl Spour on the same day. Karl is currently the acting inspector on the West cluster and is a very experienced officer. On another note, our Confidence surveys have shown that residents in Hillingdon are more fearful of a terrorist attack than before. I am looking for some feedback as to why that might be the case. If you have any thoughts or opinions on this specific area, please drop me a line – all suggestions are welcome. Jeremy Wasden on How Do I Join the SRRA? Louis on How Do I Join the SRRA? GIRISH SHELAT on How Do I Join the SRRA?